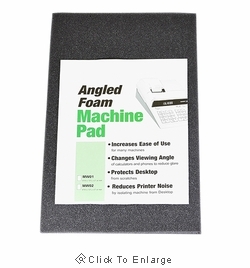 Angled foam calculator wedge helps increase the ease of use with your desktop printing calculator. It changes the viewing angle of calculators or phones to a more comfortable one and helps protect your desktop from scratches. Also helps reduce printer noise from printing calculators. Foam pad is available in large or small sizes. Please be sure to choose the right size for your desktop machine. If in doubt, size up. Small measures 8" x 10" x 2". Large measures 9" x 15" x 3".